The foot of the truss is collected together and connected to the supports by means of a cast-iron shoe (as figs. 442 to 445), which, it will be seen, is a flat-bedded casting, with, as it were, two jambs, cheeks, or posts rising from it, and between these cheeks (as they may be called) is placed the web of the T-shaped rafters; the remaining space, between the web and the two cheeks, being filled up with thin wrought-iron bars, which extend within the truss, and in their turn, figuratively speaking, grip the tie-rod. Through these two cheeks, bars, and the web of the rafter, a pin or bolt is placed and screwed up at the outside, forming a complete connection and perfect attachment of all the members to the shoe - which is itself secured to the supports by ragged bolts, leaded into a hard stone pad built within the wall. Sometimes, in common roofs, two angle-irons are bolted on each side of the wrought-iron bars enclosing the web of the rafter, being themselves secured to the pad-stones in the same manner as the cast-iron shoes (see fig. 446, which is a front sectional elevation). In large trusses, the contraction and expansion of the iron, as affected by the temperature, must be taken into consideration; wherefore the shoes are made with a sort of ribbed base, which rests on oiled rollers, working on the bottom side of an iron box built into the wall to receive the shoe or chair, as it is sometimes called. This method, of course, supersedes the use of ragged bolts, and is shown in sectional elevation at fig. 447. Where the shoe or chair has to be supported on columns, it is connected, as shown in fig. 448, to the abacus or square plate on the top of the cap of column. If there happens to be an outlet of an eaves-gutter next to a column in a roof of this description, the water must be made to run down the inside of the column as the downpipe, the water being conveyed to an inlet-hole specially cast on the column by means of a " swan-neck," as fig.449. The rafters at the apex and the suspension rod are connected together by thin cover plates on each side of the web of the rafters, gripping the suspension rod below the rafter apex, where there is a space, as fig. 450. 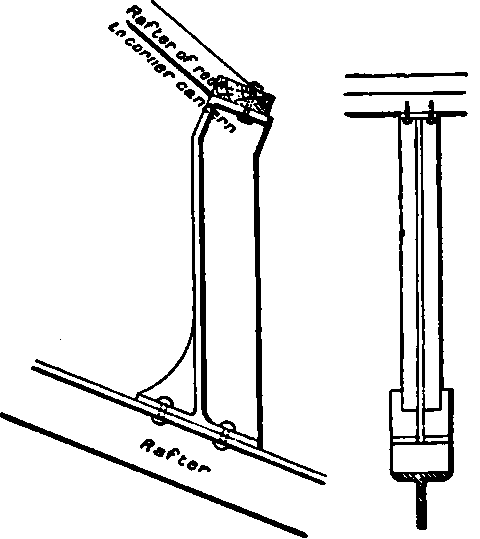 A strut and suspension rod are connected to the rafter by a joint, illustrated by fig. 451; the web of the strut being attached on one side, and the flattened eye of the rod the other. The three are connected together by a bolt, and the flange of the strut is cut off close up to (he underside of (he web of the T rafter. Struts, from their great tendency to bend, when in long lengths, under heavy weights, have often to be built up of various Nocked members, as figs. 452 to 455, in lieu of plain T-iron, which is used under ordinary circumstances. They may be either straight or bulged, the latter being preferable, but more troublesome (vide figs. 453 and 454)- The ends of the rods are forged out from the round, to grip the two plates of the strut enclosing the flattened tie-rod, as shown in the enlarged section (fig. 455). A single strut, of ordinary T-iron, is connected to the tie-rod, as in fig. 456; the web of the strut being cut off and the flange bent over the bulged tie-rod, the suspension rod going through both, and being bolted up underneath. If the flange of the strut is cut off at the top joint between the strut and the rafter, the web is cut off at the bottom joint between the strut and the tie-rod, and vice versa. The joint at the foot of the centre suspension rod and struts, when of Tiron, is as fig. 457, fig. 452 also applying to this joint, with a little modification, when the strut is built up. As it is usual to camber the tie-rods, they are made in two lengths, and connected at this joint as the illustration explains. Louvres and lanterns, on iron roofs, are constructed by cast-iron supports, secured to the top of the T rafters to carry the roof framing, as fig- 458 the wall-plate being fixed by coach screws through holes drilled on the top of the casting, as shown in elevation. When tie and other rods have to be jointed in their length, they are treated as fig. 459, which illustrates a coupling-screw, X being a minus-thread - i.e., within the circumference, and the other a plus-thread - i.e., projecting beyond the circumference. It will be seen that the turning of the hexagonal coupler draws each rod inwards or pushes it outwards, the threads being different at each end - the one a right-handed, the other a left-handed screw. Diagonal, or cross-ties, are used for tying several roof trusses together to resist a strong wind, driving at their end, and having a tendency to make them overturn. Fig. 460 illustrates their use, one end being fixed to the foot of one truss at X X, from which it runs up to the ridge of Z. Such cross-bracing is requisite for wood and iron roofs with gable ends alike. Iron roof trusses are usually placed about 7 feet apart, the same distance generally being between the suspension rods, measured along the tie-rod, and also between the struts to the rafters. The rise of iron roofs (which are generally covered with light materials in weight) is from 1/5 to 1/4 of their span; the tie-rod cambering from 1/40 to 1/15 of its length. Diameter of parts of jit-rod.